This Butternut Squash curry is a really warming vegetarian meal. 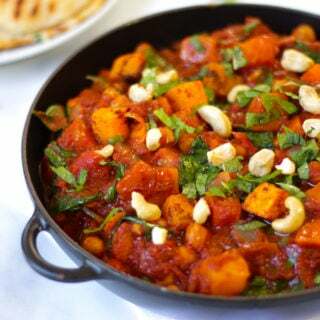 Roasted butternut squash, with spinach and chickpeas mixed with Indian spices. Toss the butternut squash cubes in approx 75g of curry paste. Place on a baking sheet and roast in the oven for 30 minutes. Whilst the butternut squash is roasting you can start preparing your curry sauce. Heat the oil in a large, heavy bottomed pan. Once heated add the chopped onion, garlic, ginger and the remaining 75g of curry paste. Fry over a low heat for around 5 minutes, stirring frequently. Add your passata, chopped tomatoes, drained chickpeas, mango chutney and garam masala. Cook for a further 20 minutes. Finally stir in your roasted butternut squash and spinach and cook until the spinach is wilted and it is all cooked through. OPTIONAL: Sprinkle with cashew nuts and chopped coriander.